This year’s Poppy Appeal seeing the RBL Club in Ferndown bringing a dance extravaganza to Ferndown with a Modern Line Dance social evening on Friday the 9th and a number of dance demonstrations, exhibitions and workshops on the 10th October. Club Chairman Gordon Whitehead commented “ we have been planning this for some time and our danceathon has a lovely ‘twist’, instead of just dancing for a good cause we are running different dance workshop sessions so the community can come along to watch, or participate.” . All proceeds will go to the Poppy Appeal Dorset Fund.Whilst there are no entry charges we do ask for a minimum donation and if you can raise optional sponsorship for your dance that’s great too. Saturday sees a host of different events. All workshops are delivered by local instructors. 10am The Event will start with a tiny tots class for just £1 entrance per child, mums and children will have a fun packed hours workshop. FitSteps came to life in 2013 as the result of a collaboration between two of the UK’s most famous ballroom dancers and Britain’s most successful swimmer! Ian Waite had a great idea. The important point to note is the distinction between the plethora of dance classes that exist and FitSteps®. FitSteps® is a fitness class, delivered through dance. The programme is based around twelve of the most popular Latin and Ballroom dances from Cha Cha Cha to American Smooth and from Rumba to Quickstep. The dances are broken down into easily learnable sections and each section is capable of being delivered at varying levels of effort, accommodating people of varying levels of fitness and dance ability. 12 noon we move local to a Dance Zumba with Chloe , this one hour workshop will provide you will enough calorie savings to have a nice coffee and cake afterwards and not feel guilty or just add them to your exercise schedule for fun knowing you have done your bit for the Poppy Appeal. 1pm With all that exercise we welcome you to stay for lunch and sample Mike’s infamous lunchtime menu . Ever wondered how those guys managed to ‘shake it, shake it? Well this exhibition, instruction and workshop will show you how. It’s different, fun and a must do. For all ages, photo showing just how young you can go but Shakers start young, with crews for all age groups….and even a Mumma’s crew. Come and have a go! Your favourite dances with a special teacher during dance sessions!!!!!!!! A great workshop, full of fun with extra on the floor teachers to help. 7pm We see Jive Riot in action with Carl. Always wanted to do those great moves? Dance to any music using the great moves which anyone can do? You will learn enough to help you at any future dance event, in fact the Rock & Roll and great music from the live band later in the evening will be one of the places you can put this into action. Rock Roll is a four step but French Jive is only two which means you can dance to any type of music, pop, classical, Latin etc ( including Jive’s which are three beat so 2 of this beat gives you three with French Jive moves). Under instruction from a qualified French Jive teacher you will be taken through a series of steps, taxi (junior teachers) will be helping you through the moves whilst dancing or you can Jive with friends or new acquaintances!. This is a really great way to keep fit, meet new people, learn to dance, be able to take your lesson to other events and build your confidence when boogieing on the dance floor. Time to strutt your stuff and dance the night away, perhaps Rocking, using moves from the French Jive workshop or just doing your own thing. 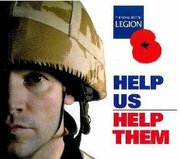 Whatever it is you will be supporting the Poppy Appeal and having fun at teh same time. Whatever your fancy our Danceathon Extravaganza will certainly ensure your day is fantastic. The children’s session are a minimum of £1 donation per child, of course we welcome larger contributions. Each workshop we ask for a minimum £5 contribution, or you may donate a £10 for any 3 workshops which are open to all ages. The evening with the live band is only £3.50, superb value for a live band. The contents of this event are copyright of RBL Ferndown Club. We thank all companies and sponsors for their kind use of material and assistance to the Poppy Appeal. Thanks must also be given to the instructors, demonstrators, and helpers who have donated their time free of charge. The RBL Club Ferndown Ltd take no responsibility for injury or health issues that may arise from participation. All dancers exercise at their risk.